Our OMA14 model is the latest addition to the family. It's proportions are more petit than it's brothers and sisters but it is fitted with the same premium quality L.E.D. 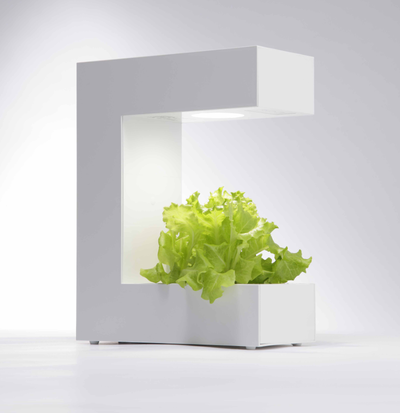 grow-lights to ensure rapid and effective plant growth. Constructed of resin the growing tray in the base can be extracted in exactly the same way as all the other Akarina models for ease of seeding and cleaning. The OMA14 includes an integrated dimmer as well as a timer unit, allowing for automatic and efficient utilisation of the grow-light. 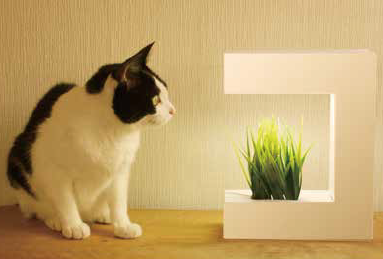 It's smaller size makes it perfect for shelf, bookcase or windowsill positioning in the home. 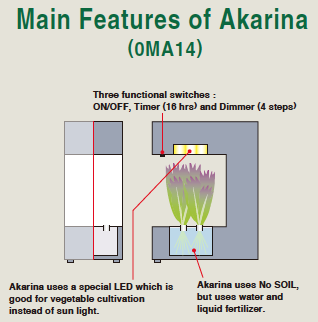 AKARINA 14 has a square growing tray that can be easily removed for seeding and / or cleaning after a growing cycle. The four step pictures below show a clear view of the stages required to grow using this model. Further details are available in the 'How to Grow' section of our website. 'The TIMES' JOURNALIST ALICE BOWE REVIEWS HYDROPONIC KITS Dec 2018. HER FAVourite OF THE AKARINA RANGE IS THE Akarina 14.